These paleo gingerbread men cookies are soft and chewy and are also grain-free, gluten-free and dairy-free! Does anyone else require gingerbread men to have a proper Christmas? It’s just not Christmas without them! You can get fancy and decorate your gingerladies and gingermen in a more complicated manner, but I was happy with the classic outline. I just used melted white chocolate. First, because I absolutely love white chocolate and second, because I try to avoid powdered sugar (although I know white chocolate isn’t any better!) If you need to keep these gingerbread men paleo / dairy-free, you’ll want to make your own paleo white chocolate. It would have been clever to try my grain-free soft and chewy ginger cookies to make gingerbread men, but I only realized this after futzing around with a new recipe creation. Oh well. The new recipe worked out wonderfully! And I was pleasantly surprised by the taste. They’re pretty molasses-y, but not overwhelmingly so. But still, not recommended for molasses haters. The dough isn’t the nicest to work with (you have to freeze it and flour the surface before rolling the dough into shapes) but it’s not that bad and not any more work than a normal roll-out cookie recipe. I eat a mix of grain-free and whole grain goodies and to be honest, I would totally take these over a whole grain version. Seriously, y’all. Make these! And just a little heads up – be careful with how you store these! I packed my container too full, pressed them down a little, and they stuck together just a bit. In a medium bowl, combine all the dry ingredients and set this bowl aside. In another medium bowl, combine the wet ingredients. Add the dry ingredients to the wet ingredients and stir just until combined. Divide the dough into four balls, place the balls in plastic wrap and chill in the freezer for at least 30 minutes or until the dough is quite firm. Preheat your oven to 350°F (176°C). Get out two pieces of parchment paper or two Silpats and flour both of them with almond flour or whatever kind of flour you like. I normally don't flour my Silpats but here it's absolutely necessary. Take out one ball of dough at a time, roll it out to about 1/8", and, working quickly, use your cookie cutters of choice to cut out the desired shapes. I prefer to cut the shapes, leaving about 3/4" between each one, and then remove the dough surrounding the shape. That way I don't have to worry about damaging the gingerbread men. Gather up the leftover dough and place back in the freezer. Bake the gingerbread men for 7 - 9 minutes. They'll still be soft when you take them out of the oven. Immediately remove the piece of parchment paper or Silpat from the pan to prevent the gingerbread men from baking even more. If you want them slightly crunchy, you can let them cool on the cookie sheet. When completely cooled, you can pipe on some white chocolate for decoration. Store in an airtight container. They get really soft if not properly stored or if left too long uncovered. I didn't pack mine up for several hours but luckily liked my gingerbread men that soft however. The only downside is that they stuck together a little (but you can easily pull them apart again). 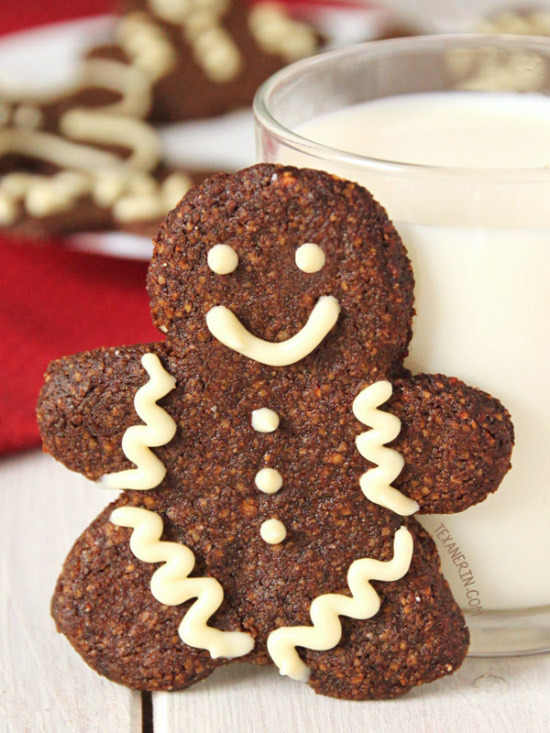 47 comments on “Paleo Gingerbread Men Cookies (grain-free, gluten-free, dairy-free)” — Add one! Made these tonight. Very tasty! I only had hazel nut flour to use instead of almond…and not quite enough so I added more coconut flour to split the difference. Pre-rolled dough and stuck in the freezer between parchment which made it cool very fast for handling, though, I found I didnt really need to cool the dough. I’m so very sorry for just now seeing your comment. It landed in spam for some weird reason! I’m very happy to hear that you enjoyed the cookies. :) I bet these were great with hazelnut flour! Good idea to add extra coconut flour. Thanks for your comment and sorry again! Game changer!! Everyone liked these. Thank you so much!! You’re welcome! Thanks for your comment. :) I’m so happy they came out well! What did you use for the icing? I made this for Christmas this year and I LOVED them! My favorite Christmas cookie. Mine didn’t look so textured like your photo. Maybe because I used blanched almond flour? I’m so happy that you enjoyed them and that they’re a favorite! I also used blanched almond flour but it wasn’t as finely ground as it should be. I now use Bob’s Red Mill and they come out much less textured looking. :) Thanks a bunch for your comment! 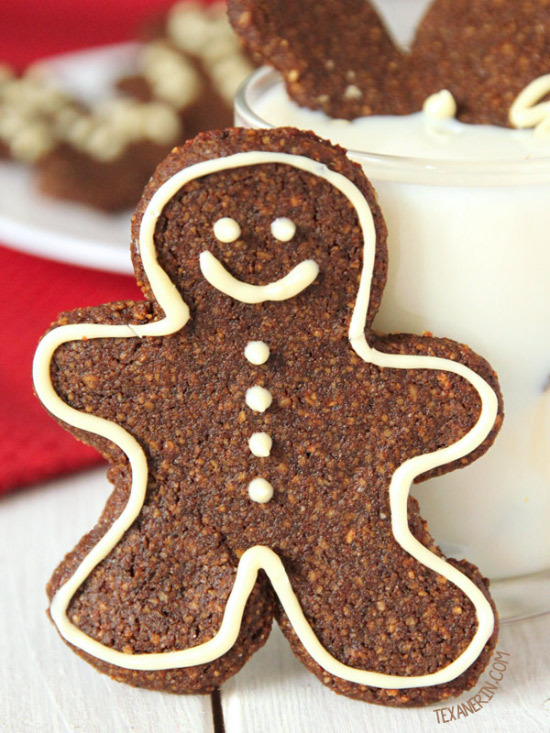 I am wondering if you have had success freezing your grain free Christmas treats – such as these ginger bread men? Thinking about making these this year but I was wondering what you would use in place of the almond meal since I have a kid allergic to nuts. My other kid, I keep gluten free…try to keep all the kids gluten free but it does not always work. Anyways, thanks. I haven’t ever tried this but here’s something on a nut-free almond flour replacement. I hope that’ll work for you! It looks promising, at least. :) I hope you’ll all enjoy the cookies! Such cute and delicious gingerbread men! I also like how you used melted white chocolate. It’s not exactly healthy, but I much prefer it over powdered sugar as well! Please tell me that you are completely aware of the complete awesomeness of the second picture? It absolutely appears that the ginger person drowned the other in the cup of milk and is completely pleased with himself (note the smirk) for doing so. It’s grain-free cookie homicide.. and it’s perfect. Coffee came out of my nose. Haha. Thanks so much, Dani! I’m happy you noticed the gingerbread man homicide going on in my post. Violence is never okay but gingerbread man on gingerbread women violence is quite sweet, right? ;) But now I wish I would have done it the other way around and have the gingerbread woman drown the gingerbread man. I’m sure he did something to deserve it. :D Thanks for your comment! It made my day! I made some of these for my daughter to decorate during thanksgiving weekend! I froze half the batter to use during december as well. Thanks for the recipe. They had a great flavor and texture! So I love gingerbread men, but coconut does not always agree with me..So I was wondering if I could substitute it will all purpose gluten free flour? And if so how much would you say? Hi Kyra! I don’t think using all-purpose GF flour would work here because coconut flour is totally different and absorbs a lot more liquid than other types of flour. Sorry! :( But I looked around and found these gingerbread men that use all-purpose GF flour. :D I hope that recipe will work for you! These look wonderful, Erin. So glad to hear they are really soft and chewy! Those are so cute! I love the upside down guy swimming in the milk…so funny! Wow these are just adorable – and healthy! And coconut flour, almond flour, molasses, honey – some of my faves right there! I can only imagine how much great texture they have and I want! Okay, this is the cutest gingerbread man I've ever seen. I love that there's one floating in the cup of milk in the background. Cracked me up! They sound delicious! They are adorable, these little gingerbread people. Can't wait to make these during the holiday break. Thank you Erin, and a very merry and warm, cozy Christmas to you and your family! How cute are your gingerbread men? I love that they are chewy too! At least with chewy ones they are double the enjoyment. The look like they could be hung on the christmas tree. Happy Holidays! These are so cute! I love the one drowning in the milk… hahaha… Made me chuckle. 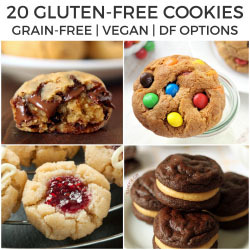 These sound really delicious – I do love a good chewy cookie! that frosting on him is so adroable…and i love a chewy cookie too! Aww love these! They chewier the better! I agree…I would definitely prefer chewy cookies over crunchy ones. These look so good, and so cute! I love the textured look they have. I'm all about chewy, not crunchy, cookies, too – so these are totally my type of gingerbread man. YUM! Wow these are awesome and grain free!! 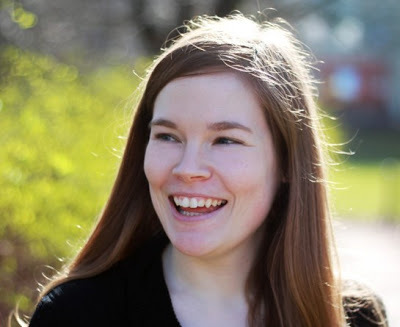 I am so behind as well in the blogging world…oh well. And yeah, I feel kind of bad just how behind I am. I got up early today to catch up but I'm still replying to the comments on my own blog and haven't even begun to look at Google Reader or any social media. Yikes! A zebra?! How do you crochet a zebra? That sounds amazing. I hope you post a picture of it on your blog. And I love that you've been doing Christmas crafting, too. Homemade presents are so much more fun to give / receive! These look wonderful! A soft chewy delicious ginger biscuit!